Distant Reiki courses with Aschima - Awake Healer, Clair Intuitive, Mantra singer and Reiki Teacher. Hungry for Healing and Higher Life/Vitality - CHI magic Life energies, Opening your unique Gifts - Knowing and Learning the Reiki power/ Keys to live from Higher energies and give Healing to yourself and others. Aschima is giving online REIKI attunements ( all levels ) with Course material and mail support during your practice. Course material consists of Word documents and Youtube videos. The First session is with Attunement of a reiki symbol and extra Healing with opening conversation about your unique Soul journey. - "Reiki Courses with Aschima Online: Every course will give you healing and enhance your chakras, experiences of becoming "more alive, whole and integrated" with more Joy inside - Meditative energies - As well as your healing abilities. 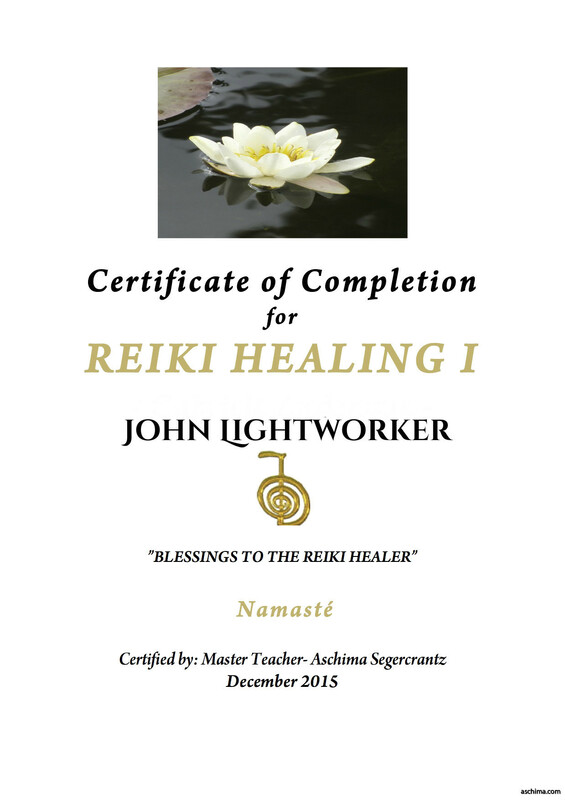 Receive Certification of Your Healing abilities as a Reiki healer. Reiki 1 Groundlevel - Reiki attunement of Power symbol "Cho Ku Rei" - Learn to give Reiki - to yourself and to clients with intention and deepen your own intuition. 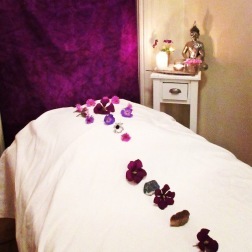 Reiki 2 - Learn to Give a Distance healing session and enhance your healing abilities. Initiation with 2 Reiki symbols - the distant symbol "Hon Sha Ze Sho Nen" and "Sei He Ki". 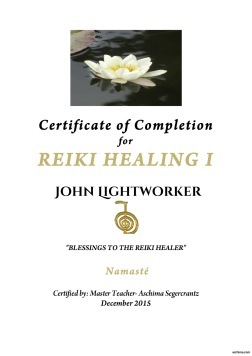 Reiki 3 Master level : Learn to give an Reiki Attunement and Mastering Reiki healing. Learn about how to step out of any remaining insecurities as a healer and any ego - to universal love and understanding. Attunement with power symbol "Day Ko Myo" and Fire symbol "Raku." - Aschimas New Symbol - received to help those moving through spiritual awakening and Enlightenment to have a wide aura and being able to balance their emotions, receiving inner light and walk their path without disturbance by other peoples stress or negativity in the third dimension... Course material include to give reiki with the symbol to others and to yourself, aura protection ritual by Aschima and the beautiful attunement with extra healing and a blessing. 5. Reiki Course with Aschimas new symbol Sacred OM - Enhance meditative energies - Oneness - Stillness inside, no mind experience and Inner connection with Presence - more buddha laughter and freedom inside. Are you giving courses, there is work material how to use the symbol in your classes and healing work. 6. Reiki Teacher Course with Aschima . All courses include reiki attunements with high vibrational energies and keys to change and transform to Flow again. Work material in PDF/ Youtube videos and personal feedback during practicing reiki healing. Aschimas support will help you to become Self secure of your healing abilities and Enhance your own intuition. In Each course and with every attunement you give an intention forward that will create and manifest for your High soul purpose duringand after the course. Aschima helps you with Karmic energies and enhance your own personal positivity . harmony, calm and for your honesty along the way. Your music and singing voice, are healing into the soul. "I've met my Twin Flame through you. -Started up my business through you. -You made me believe in me. -You have helped me to release blockages within me to the free woman I am, everything is forgiven and everything is love. "Do you also want to train to become a Reiki Healer and Reiki Master? I've been lucky enough to find Stockholm's absolute best teacher and Master of Reiki. I can highly recommend her Aschima S"
"There is no one who can introduce Reikin in such a beautiful, useful and vibrant way as Aschima. Now I'm becoming Reikimaster and I can not imagine a better teacher. Everyone should meet Aschima when she is a gift in life."